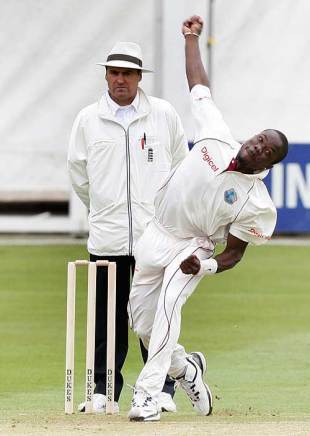 A spirited bowling effort from Windward Islands helped them beat Guyana by five wickets at Windsor Park in Dominica. Windward's win was set up by a commanding bowling effort after Guyana won the toss and elected to bat. Opener Sewnarine Chattergoon was lbw to Nelon Pascal with no score on the board and Guyana never recovered from the early blow. Pascal and Darren Sammy ran through their batting and at 73 for 7, it looked like Guyana could fold for less than 100. A fighting 49-run stand between wicketkeeper Derwin Christian and captain Veerasammy Permaul helped take the score past 100, but both batsmen were dismissed by Sammy in quick succession as Guyana wilted to 138 all out. Pascal ended with 5 for 50 while Sammy had figures of 4 for 51. Permaul ( 6 for 91) then led from the front with the ball as Windward's batsmen looked in danger of conceding the advantage given to them by their bowlers. Their batsmen struggled against Permaul's left arm spin and 158 for 8, looked like they would be dismissed without a substantial lead. However No. 11 Delorn Pascal wrested the initiative back with a half-century allowing Windward to reach 252 before they were dismissed. Guyana's batsmen gave a better account of themselves in the second innings with half-centuries from Narsingh Deonarine (84), Assad Fudadin (51) and Christopher Barnwell (75) carrying them to 294. However their poor effort on the first innings, together with the 114 -run deficit meant Windward needed 181 for victory. A solid performance from their top order - Devon Smith and Andre Fletcher made forties, while Johnson Charles top-scored with 66 - gave Windward a comfortable victory.